There is something sensational about biting into a freshly baked cookie that cannot be replicated with any other confection. The sweet taste and buttery texture in each bite transports you back to a simpler time; a time when learning how to tie your shoe was a priority on your agenda. Whether they are decadently prepared with chunky chocolate morsels or studded with crunchy walnuts, people often indulge in their choice cookie when looking for that extra pick-me-up. 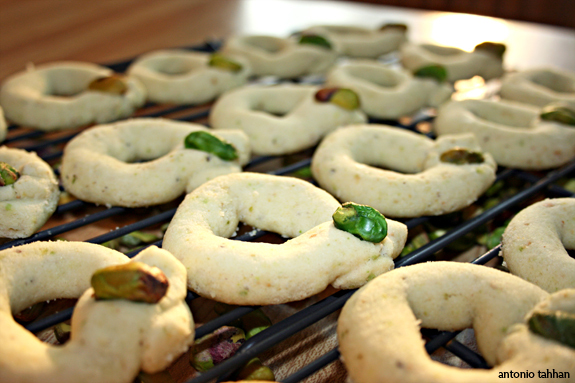 Called Ghraybe in the Middle East, these fragrant pistachio cookies are a classy addition to any cookie repertoire. Characterized by their powdery soft disposition and exotic essence, these cookies are always a treat in my family. Clarify butter by melting regular unsalted butter over low heat and skimming off the diary solids that float to the top. Measure out 200 g. (approximately 1 cup) and set aside to cool. Mix cooled clarified butter and confectioners sugar (approximately 1½ cups) for about 3 minutes or until light and fluffy. Mix in orange blossom water and rosewater. Add the super fine semolina (approximately 1/2 cup), flour (approximately 1 1/3 cup), ground pistachios (approximately ¼ cup) and mix until it comes together as a dough. Form little rings by rolling a piece of dough between your hands (or on the table) and looping it so that the ends overlap. Place a pistachio where the ends meet and set on a baking sheet lined with parchment paper. Refrigerate for 15-20 minutes, then bake in a 300 degree oven for 15 minutes or until just set. Place the cookies on a cooling rack and enjoy!! Note: You can find Orange Blossom Water and Rosewater in any Middle Eastern supermarket or in most specialty food stores. You can also find them online in Dayna’s Market. Posted in cookies, desserts, Middle Eastern, recipe, snack by Antonio Tahhan on September 30th, 2007. You can follow any responses to this entry through the RSS 2.0 feed. You can leave a response, or trackback from your own site. hi they look very nice ~~ i really like & have all the ingredients in the recipe except unsalted butter to make enough clarified butter even cutting the recipe in half .. so i had to stop there .. i will try next time. is there any reason to use clarified one?